The biggest problem X-Men: Apocalypse faces is one it isn’t even responsible for. 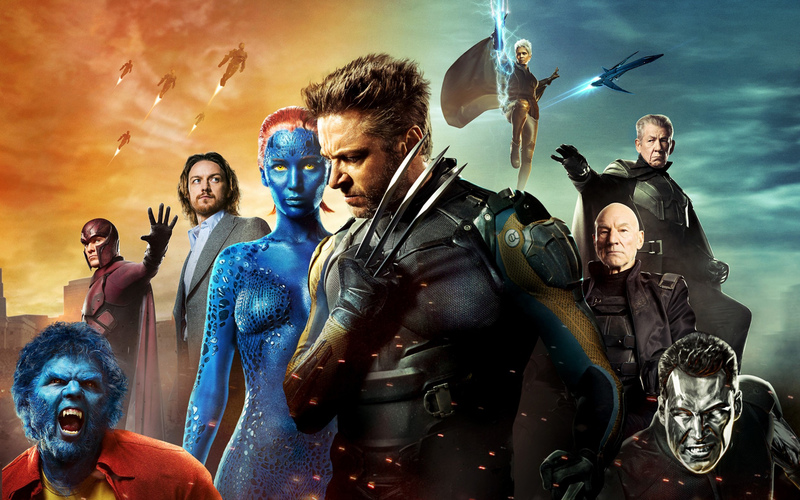 X-Men: Days of Future Past was and will always be one of the most definitive superhero experiences at the movies. Asking for follow-up to that is unreasonable, let alone damn near impossible, and to its credit, X-Men Apocalypse tries. It tries too hard, but at least it tries. Taking place ten years after the events of Days of Future Past, Apocalypse shows an ancient threat that reawakens deep within the pyramids of Egypt. The first known mutant to ever historically exist, En Sabah Nur (Oscar Isaac) awakens to a world ran amuck in chaos and disorder. Political corruption. Poverty. War. Violence. En Sabah Nur sees all that’s wrong with the world and decides that, in order to save it, it must be destroyed and rebuilt. Back in Westchester, at Xavier’s School for Gifted Youngsters, Jean Grey (Sophie Turner) awakens from a horrible nightmare. Witnessing horrible visions of the end of the world, Jean is convinced that these visions are real and that they will come to pass. Her professor Charles Xavier (James McAvoy) thinks these are just dreams. Yet, as one thing happens after another, he begins to think there is something devestating going on that even the X-Men might not be able to stop. The third movie for the newly rebooted X-Men universe, X-Men: Apocalypse boasts a lot of the strengths that its predecessors have. For one thing, the performances are superb, and the actors exemplify their characters down to the molecule. 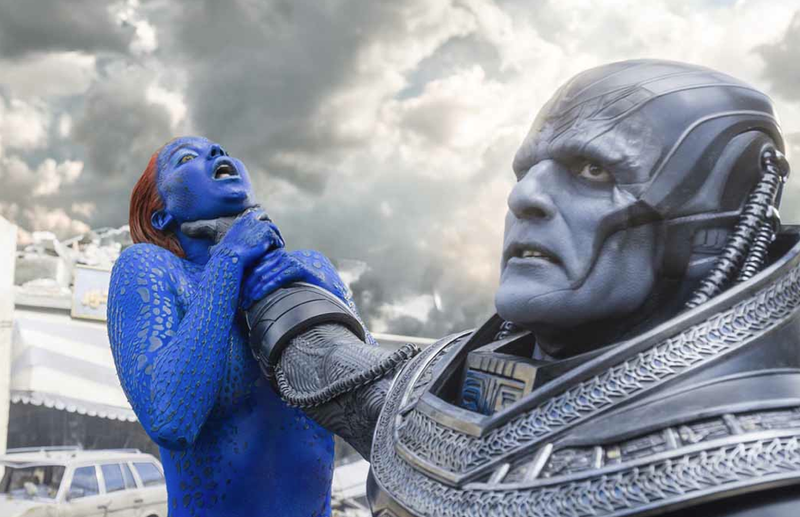 McAvoy is earnest and well-intentioned as Xavier, while Jennifer Lawrence is motivated and sharp-shooting as Mystique. The actor I noticed most, however, was Michael Fassbender, once again adopting the role of Magneto. Every time I watch him, I am reminded of this character’s tragic history and how other people’s cruelty has driven him towards violence and extremism. Without giving too much away, there is one moment where Magneto sustain a crippling loss that comes to define his character the most throughout the picture. These moments remind us that Magneto is not a villain, but rather a tragic hero who fell through grace, and Fassbender is brilliant in capturing both the character’s regret, penance, and guilt throughout the movie. The action is also incredibly polished, especially for an X-Men film. En Sabah Nur himself is the most omnipotent, wiping enemies away with a dash of his hand or the white glow of his eyes. Havok (Lucas Till) reappears alongside his brother Cyclops (Tye Sheridan) for the first time, and their red energies run amuck obliterating anything in their path. The most fun X-Man to make a return, however, is Evan Peters as the speedster mutant Peter Maximoff. You remember his signature scene at the Pentagon in X-Men: Days of Future Past. His scene in this movie blows that one out of the water. I won’t give much away, but saving over 30 people at superspeed is much more impressive than taking out six security guards in a kitchen. This sequence was funny, exciting, and most importantly, entertaining. His scenes were easily my favorite from the film. The action and the characters culminate together fluidly, similar to the other X-Men films. The differences lie in its story, or more specifically, in its lack of focus. There are about five different stories packed into one in X-Men: Apocalypse, and most of them are unnecessary. You have so many unraveled narratives trying to weave together into one that quickly falls apart once the plot starts picking up speed. Take, for instance, the plight of Magneto. His story is pure tragedy. His hearbreak, his pain, his loss, it echoes of Magneto’s earlier history and builds into a climactic moment between himself and his transgressors. The scene should have been a moment of suspense and satisfaction, but then all of a sudden, En Sabah Nur appears on the scene and completely disjoints the narrative. The whole film is like that, building up to big moments and then suddenly switching to other ones. There’s Xavier’s arc, then there’s Mystique’s, then Magneto’s, then Jean’s, and then Cyclops’. The most dissapointing to me is Peter. His story has to deal with his true parentage, but it never even leads anywhere. Screenwriter Simon Kinberg and director Bryan Singer build all of this effort up for nothing. No conclusion. No resolution. No payoff. That’s because they don’t have a focus, and the picture ends up losing our interest, despite all of its spectacular action. X2 and X-Men: Days of Future Past remain to be the best entries of the franchise, while X-Men Origins: Wolverine is the unoquivocal worst. This movie falls in the middle ground. Like its predecessors, X-Men: Apocalypse has great action pieces and performances, but it collapses under the weight of its narrative while simultaneously lacking in depth and development. As Jean Grey observes after seeing Return of the Jedi, “At least we can all agree that the third one is always the worst.” You read my mind, sister. Has anyone ever stopped to wonder why all of the best of the year lists have to be in the top ten? Like, what sort of critic was working on his list and thought that ten would be the magic number? Why ten and not twelve? Or fifteen? Five? Twenty? Eight? Why was ten specifically chosen as the big number? Was it chosen at random, or was it actually chosen for some relevant, significant reason? Regardless of whatever the case may be, I’m choosing to be a little rebellious this year. For the past few years, I’ve seen enough films to make a “Top 15″ list if I wanted to, but if I had done that, my site viewership would go down by about twenty views. So this year, to battle the preconceived notion that “best of the year” lists have to have ten movies, I’m doing two different things. 1) I’m adding an “honorable mentions” selection that while those films aren’t necessarily in my top ten, they are still significant films that have contributed to the year’s industry regardless. 2) In honor of our first full year without the wise, sometime snarky, words of film critic Roger Ebert, I’m offering a special Grand Jury Prize, which honors a film from the year which has made a notable accomplishment that fits outside of my year’s top ten. As always, there is a few things you need to know before I get into my year’s best. First of all, I haven’t seen all of the films the year has had to offer. I’ve heard from so many people how Jean-Marc Vallee’s Wild was emotionally stirring, with Reese Witherspoon’s performance being the greatest highlight of the film. I’ve also read from critics that Selma, A Most Violent Year, and American Sniper were great movies as well, but guess what? None of those movies get a wide release until after Dec. 31, so I’m not able to even see those films until after the year anyway. So what am I going to do? Release a revision to my current list, or add those films to 2015 if they’re good enough? I’ll make a decision when it comes to that. It’s the studio’s faults for releasing those movies so late into the year anyway. Blasted film mongers. Secondly, and perhaps more significantly, this is my list for the best films of 2014. Not yours. There has been high praise from many notable films of the year, including Edge of Tomorrow, The Theory of Everything, and Captain America: The Winter Soldier. None of those films will be on my top ten list because I didn’t deem them worthy enough to be on there. It’s nothing against the films or the filmmakers: I just didn’t think they were good enough. If you’re not satisfied with that, then please, make your own top ten list. I’d love to read it, and if your reasonings are sound enough, I’d like to share it with others. A mesmerizing, breathtaking, and exhilarating journey that may have only slightly exceeded it’s grasp. Based on an idea by physicist Kip Thorne and directed by Christopher Nolan, Interstellar takes place in the future on a dying planet Earth, where the only source of sustainable food is by growing corn. When former aircraft pilot Cooper (Matthew McConaughey) stumbles upon a secret station that has been hiding NASA for so many years, Cooper enlists in a daring space mission to find a new planet that will be able to sustain and save the human race. A testament to the quality of film that Nolan is consistent in making, Interstellar is a brilliantly woven, thought-provoking plot, invoking the same themes of humanity and identity that Nolan exercises in all of his films. McConaughey reaches an emotional depth much deeper than past “Nolan” actors, and succeeds in making his character more human than hero. 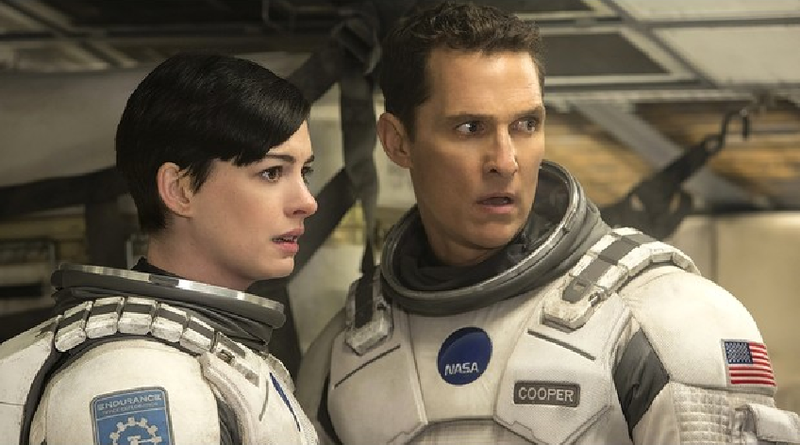 This is Nolan’s most emotional movie yet, but it’s also his most complicated and convoluted. But if Nolan’s only real flaw with this film is being overly ambitious, I don’t consider that a flaw at all. Three and a half stars. A crafty and artsy film that acts as a homage to the early days of cinema. After being framed for a violent murder of one of his former hotel guests, Concierge Gustave (Ralph Fiennes) teams up with his young apprentice Zero (Tony Revolori) to set out and prove his innocence through a series of weird, wacky, and crazy adventures. 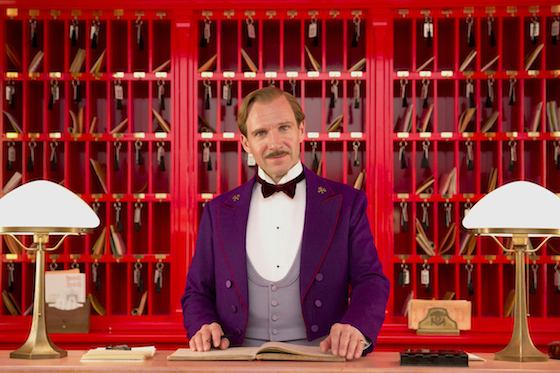 Written and directed by Wes Anderson, who was nominated for an Academy Award for The Royal Tenenbaums and Moonrise Kingdom, The Grand Budapest Hotel is a peculiar, quirky film, a fun and enjoyable ride in it’s own singular way. Anderson is very specific with the direction of the film, using practical effects and set pieces that gives the film a very distinct visual style and aesthetic. The antics Gustave and Zero go through are the stuff of slapstick gold, with these guys doing silly stunts and chase sequences that reminds me of the silent film days of Buster Keaton and Charlie Chaplin. It’s definitely seasoned for the art house crowd, and it’s definitely more difficult to appeal to the masses. But if you allow yourself to be lost in it and have fun with it, you’ll find that it is easily the most unique film of the year. Three and a half stars. A wildly exciting and entertaining animated ride that appeals to both kids and adults. 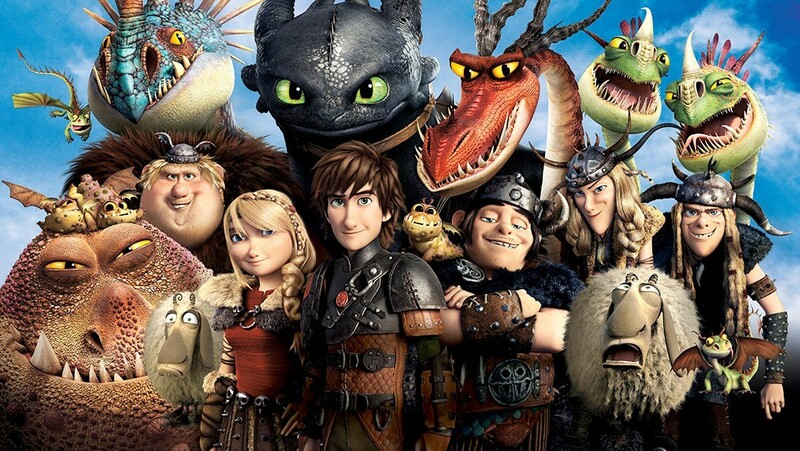 When a crusade of dragon-hunters reach the land of Berk and begin their hunt for the flying beasts, Hiccup (Jay Baruchel) must team up once again with his dragon Toothless to stop the brigade and save Berk’s dragons and dragon riders. Written and directed by Dean DuBlois, who returned from directing the first film, How To Train Your Dragon 2 is a near-perfect follow-up. It hits on every note it needs to, from the comedy, to the animation, to the action, to the emotion. Hiccup is a much stronger, yet more vulnerable, character now, and needs to face more mature situations now as a grown man rather than as he did when he was a boy. In many ways, How To Train Your Dragon 2 is to it’s first counterpart as Hiccup is to his younger self: they both grew. Three and a half stars. A brilliantly frustrating thriller that exercises themes of infidelity and media harassment. 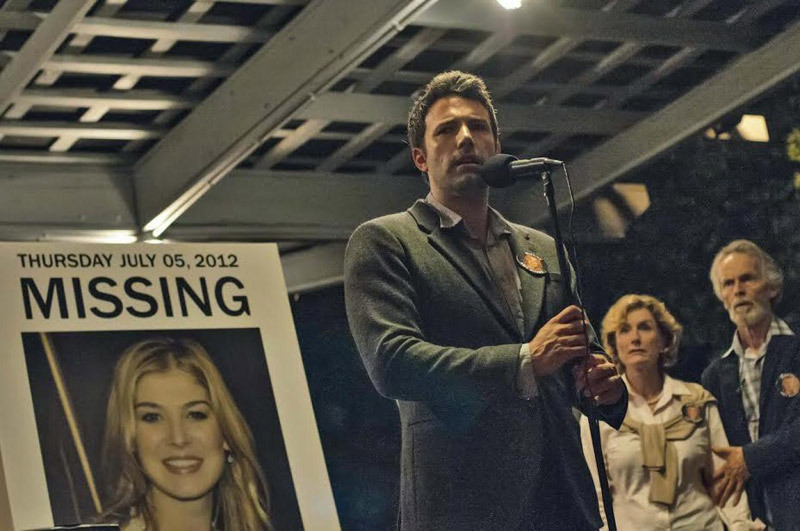 When Nick Dunne’s (Ben Affleck) wife Amy (Rosamund Pike) goes missing, all eyes turn to Nick for what happened to his wife. When clues slowly surface and more details surrounding the disappearance reveal themselves, everyone is asking the same question: did Nick Dunne kill his wife? Directed by David Fincher and written by author Gillian Flynn, Gone Girl is a masterfully orchestrated thriller, equal parts daring, inventive, intelligent, and unpredictable. Fincher propels Flynn’s brilliant plot forward with expert direction, eye-striking camerawork, and a cast that Fincher pulls the best from. This movie is like a game of cat and mouse, except no one really knows who is the cat or mouse. There is not one note in the film that you can guess is coming. Three and a half stars. A compelling and exciting survivalist-drama that looks at the human/primate condition as two sides to one coin. After the chemical attack on planet Earth that took place at the end of Rise of the Planet of the Apes, Dawn of the Planet of the Apes follows the story of Caesar (Andy Serkis) and Malcolm (Jason Clarke), the leaders of the apes and the humans, respectively. As the human-primate war rages on violently, Caesar and Malcolm begin to see that the apes and the humans aren’t so different from each other, and they begin to explore any possibilities of peace between two races. 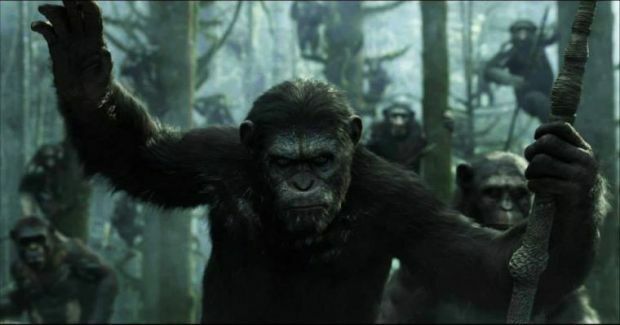 Matt Reeves builds an intelligent, in-depth story around Dawn of the Planet of the Apes, and handles its premise with skill and precision. It surprising that the basis of this film wasn’t grounded in action or ridiculous CGI stunts, but rather in small, intimate moments of conversation and ape-sign-language that characters share with each other. Serkis is a revelation in the movie, and deserves an Oscar nomination for both his physical and emotional performance. Four stars. One of the most mesmerizing, unique, disturbing, shocking, and darkly funny films I’ve ever seen. 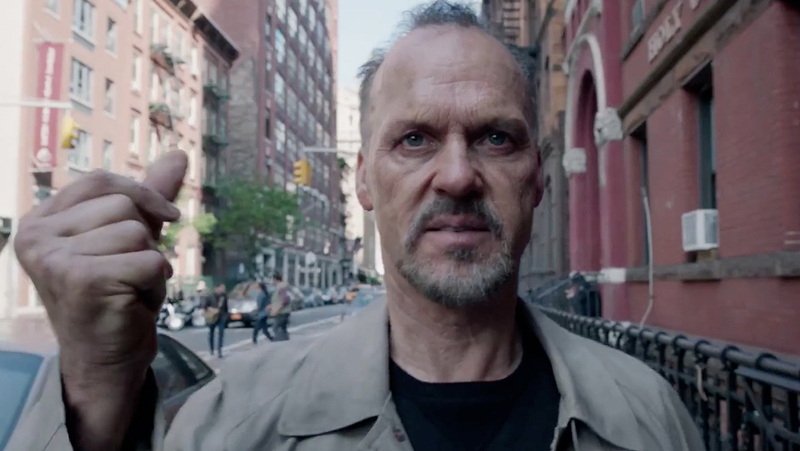 Alejandro Gonzalez Inarritu writes and directs this ingenious dramedy starring Michael Keaton as Riggan Thompson, a washed-up movie actor trying to escape his image in a former superhero role by adapting his favorite broadway play to the stage. Keaton is a natural in the role, relating his own experience to portraying Batman in order to further authenticity for the character. Cinematographer Emanuel Lubeski contributes to the visual design of the film, shooting and editing it to look like one, continuous shot rather than multiple longer takes. But Inarritu is the most essential storyteller here, making a visual and emotional masterpiece that is so distinct in its own language that it is impossible to define it, let alone replace it. Four stars. One of the most edgy, thrilling, and provocative films of the year. Miles Teller stars as Andrew, an upcoming college student who is majoring in music and dreams of becoming one of the best drummers in the country. 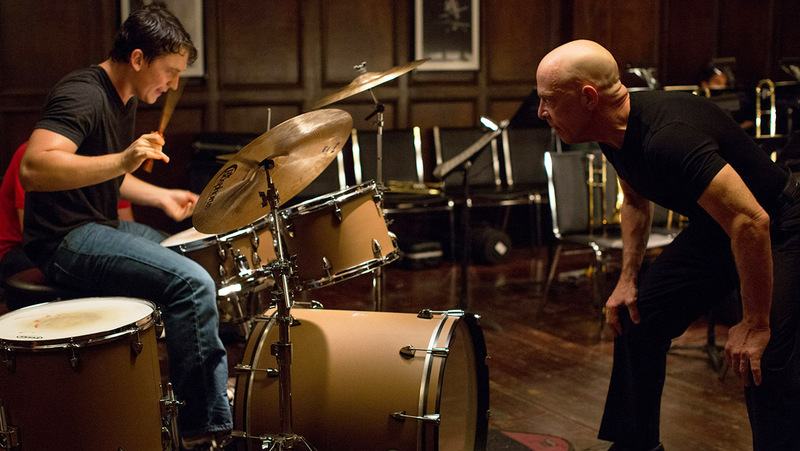 A series of events lands him in the top jazz orchestra of Shaffer Conservatory and under the tutelage of Terrence Fletcher (J.K. Simmons), a brilliant but harsh and antagonistic instructor who is known to go very hard on his students. Andrew and Fletcher both develop an intense rivalry that both hurts Andrew, angers Fletcher, and yet equally compels them both to become the very best they can be. Writer/director Damien Chazelle conducts both actors through his sophomore effort, and does a great job in producing a tense, electric vibe consistently throughout the film. Teller and Simmons’ chemistry with each other is equally perfect, with the both of them bouncing off of each other’s words and emotions as perfectly as a drum beat. This film is about more than just music. It’s about the human desire to be great and what sacrifices we’d make to get there. Four stars. The most revolutionary film of the year, ambitious in both production and vision. A twelve-year project pioneered by writer/director Richard Linklater, Boyhood tells the story of Mason’s (Ellar Coltrane) childhood, chronicling his entire life from when he was six years old, up until when he turns 18 and leaves for college. The movie isn’t so much a story as it is a scrapbook of memories, and Linklater is pulling each photograph out of it just to show it to us. When he is younger, Ellar isn’t acting but living, behaving like any other child would in the moment because he is in the moment. As he gets older, his performance gets more stagnant and Coltrane becomes more of a surrogate for us to express our emotions through, rather than experiencing his own. 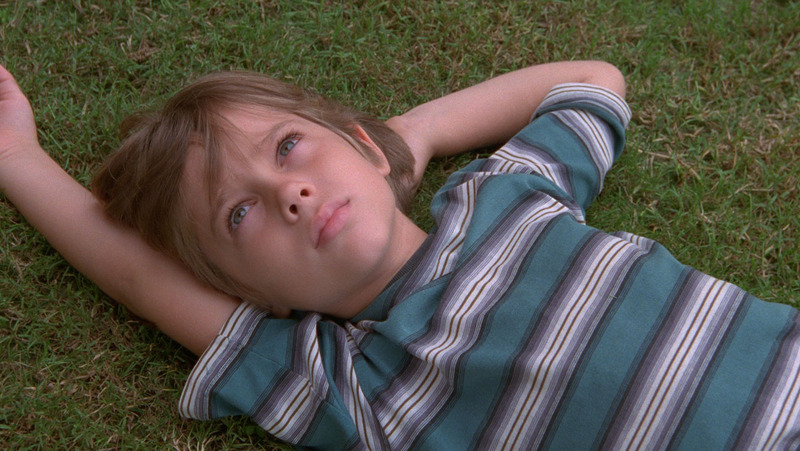 In this day and age, it’s rare to find a film as real and honest as Boyhood is. Four stars. The best entry out of the X-men franchise, and the best superhero movie of the year. Serving as a sequel to both 2011’s X-men: First Class and 2006’s X-men: The Last Stand, X-men: Days of Future Past is set in the apocalyptic future where mutants are being exterminated by humanoid robots called “Sentinels”. Having only one chance to go back in time and stop this future from ever happening, Charles Xavier (Patrick Stewart) and Magneto (Ian McKellen) send Wolverine (Hugh Jackman) through time to their younger selves (Portrayed by James McAvoy and Michael Fassbender) so they can stop the triggering event and save the future. Directed by Bryan Singer, who formerly helmed the first two entries in the franchise, X-men: Days of Future Past is a game changer. It is not only a visually-dazzling and highly climactic sci-fi blockbuster: it is a vastly intelligent and contemplative story that focuses on its recurring themes of racism and xenophobia, once again bringing the consequences of discrimination to the forefront. X-men: Days of Future Past is one of those movies that restores your faith in the superhero genre. Four stars. Surprised? I’m not. The Fault In Our Stars is one of the most magical, heartbreaking, and genuine films you will ever see, and is more than worthy of being called the most emotional film of the year. 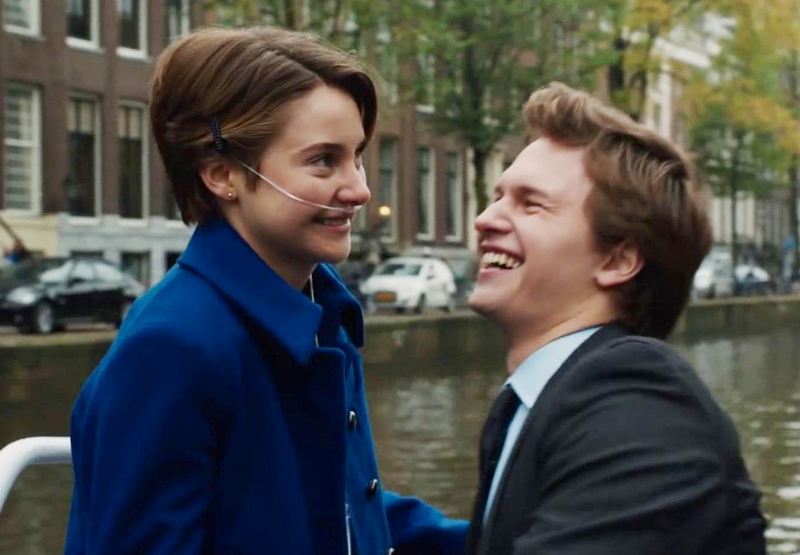 Based off of the novel by John Green, The Fault In Our Stars follows the love story of two Cancer-stricken teenagers: the shy and book-loving Hazel Grace (Shailene Woodley) and the optimistic amputee Gus (Ansel Elgort). Written and directed by independent filmmaker Josh Boone, The Fault In Our Stars is one of the best stories ever translated from book to film. I initially was skeptical on seeing this film, considering how much it seemed to have been doused in rom-com syndrome. The reality couldn’t be further from the truth. Boone adapts Green’s story perfectly to the big screen, retaining everything in the novel from the visual details to the words that were written. But its Woodley and Elgort that sells it so well, their chemistry that vibrates so wonderfully with each other and leaves such an impression on you. Trust me when I say this isn’t your typical rom-com: it’s a heartfelt drama disguised as a tween movie, and it is the best of it’s kind. Four stars. And finally, this year’s first Grand Jury Prize appropriately goes to Steve James’ documented biography Life Itself. Following Roger Ebert’s life and career from him growing up in Chicago, to when he got his first reporting job, to when he won the Nobel Prize for film criticism, to when he lost his best friend, to when he got Thyroid cancer, this film is everything that Roger Ebert is: funny, honest, heartfelt, unabashed, unflinching, and real. It doesn’t give you a peppered-up look at his life: it’s whole and accurate, as genuine as any of the reviews he’s written. I’m probably biased towards this subject, but the subject doesn’t count as long as it is handled well. James’ handles this story with respect and humility, and ends up telling a story about life itself rather than just limiting it to Roger’s story. It’s my favorite documentary of the year, and it brings me great pleasure to award my first Grand Jury Prize to this wonderful film tribute. Honorable mentions include the creepy and morally ambiguous Nightcrawler, the funny yet stylish Guardians of the Galaxy, the humorously innovative The Lego Movie, and the quietly thrilling The Imitation Game, featuring the year’s best performance from actor Benedict Cumberbatch. Not all films can be honored at the end of the year compilations, but this year I was glad to have seen so many films and give each of them a chance to shine in their own way. All the same, if you feel differently about some of the films on my list, or you have seen another film that deserves to be recognized, please comment about it. Or make your own list. 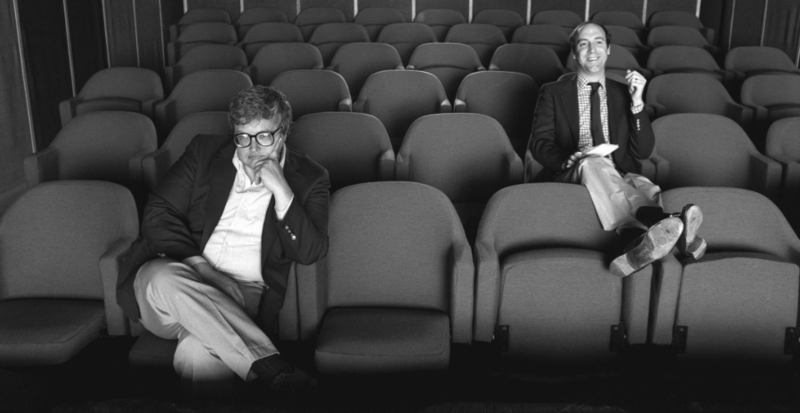 Movies are deemed as great films not from individuals, but from the masses, and the only way you can tell if a movie has truly accomplished something is if it has the same effect on all its viewers. The next stage in superhero cinema evolution. X-men: Days of Future Past ranks among the best superhero sequels I’ve ever seen, one I would instantly compare to that of Spider-man 2 or The Dark Knight. There were so many things that needed to be done, so many risks that needed to be taken, and so many ways this movie could have failed. It didn’t. From the opening sequence to its last breathtaking moment, my mind was blown and the comic-book nerd in me was absolutely filled with joy. The movie did more than simply expand the franchise: it redefined it. We open on a post-apocalyptic future that hasn’t been this catastrophic since James Cameron’s 1984 film The Terminator. Years after X-men: The Last Stand took place, humans are now being hunted by the same weapons they created in the first place: the Sentinels, a coalition of dangerously armed robots who can track and exterminate any mutant they can find on planet earth. Amongst the ruins of battered buildings and fallen icons, the human race has now been collected into a sort of concentration camps: all that’s left for the mutants then is the mass graves filled with the dead bodies of their kin. Lifelong frenemies Charles Xavier (Patrick Stewart) and Magneto (Ian McKellan) collaborate on a plan they would like to enact. Besides having the ability to phase through walls and objects, Kitty Pryde (Ellen Page) has recently developed the ability to transfer someone’s consciousness into their younger bodies in the past, allowing them to change the future and avoid the unfortunate outcomes that might become of them. Kitty has been able to use this ability on multiple occasions now to save her friends, but now Professor X and Magneto want to go back into the past (1970, to be exact) to prevent the event that triggered this horrifying future and save human and mutantkind as they know it. Problem is, Kitty can only send someone back a few days or weeks at a time. Any further than that and she risks tearing apart the mind of the person she’s sending back to the point beyond repair. Luckily, Wolverine (played by Hugh Jackman, who else?) has the ability to heal himself at a faster rate. So Professor X and Magneto decide to send Wolverine back into the past to coerce their younger selves (portrayed by James McAvoy and Michael Fassbender, respectively) to stop the triggering event and save the future. Serving as a sequel to both X-men: First Class and X-men: The Last Stand, and incorporating characters and actors from both translations, X-men: Days of Future Past is, in a word, a game changer. It brings in all of its key players, from the original cast members and its most revered director Bryan Singer, to the newcomers who’ve newly defined their roles, including McAvoy as Xavier and Fassbender as Magneto. Everyone meshes so perfectly with each other, especially Jackman once again, who essentially has to react to characters from two different time zones. There hasn’t been a cast this big since Joss Whedon’s The Avengers, and I’m tempted to say the movie is better because of it. Do I really want to stand here though, and compare Days of Future Past to that of The Avengers? Yes I do. The Avengers was a bold, brave step forward in comic book evolution, combining characters from five different movies to make a superhero epic that hadn’t been tried before. Days of Future Past follows that same model, bringing in characters from six of its movies, but the end result is vastly different. There’s a much deeper plot going on here, a vastly intelligent and contemplative story that elaborates on its recurring themes of racism and, once again, bringing in the consequences of discrimination to the forefront. I loved X2 for this very reason, for it being more than just a comic book movie and focusing itself more as a political thriller with comic book elements thrown into the mix. This movie is that to, like, the tenth power. Oh yes, this movie will fill comic fans with glee everywhere. Similar to the small little easter eggs that can be picked up in other Marvel movies (Note: The Doctor Strange reference in The Winter Soldier), this movie too has sweet little moments that comic fans can pluck from the ground and take a moment and appreciate the aroma. My favorite had to be a moment where a mutant named Peter (Evan Peters), who can run at supersonic speeds, rests in an elevator with the younger Magneto as he’s helping him escape from prison, and makes a comment about his long-lost father. That’s just the tip of the Bobby Drake-iceberg. There’s so many moments I can pull from that filled me with joy and happiness, while others filled me with dread and angst. The film orchestrates its emotions wonderfully, and in every fabric of the film I felt what I was supposed to feel. I’m going to go out on a limb and say this is the best X-men movie in the series so far. Bold claim, I know, but it deserves it. From its first moment to its last, Days of Future Past is completely, utterly, fascinatingly mind-blowing and involving. From its quietly hinted-at themes of xenophobia and extermination to its climactic action scenes where we don’t see how on earth our heroes can win, Days of Future Past combines the best parts of all of the movies and makes itself the best entry out of them. Many audiences have recently been experiencing superhero movie fatigue, with movies such as Man of Steel and The Amazing Spider-man 2 recently being met with mixed reaction amongst audiences and in the box office. Days of Future Past is one of those movies that restores your faith in the genre. How can you “cure” what was intended as a gift? There’s an obvious danger with the production of second sequels made with planned trilogies: how do you keep things fresh and interesting and make sure none of the material isn’t stretched out or forced? For many trilogies, the third entry is the one filmmakers are usually least concerned about. Why should they be? They’ve already made their biggest impact with the first two films and people will go and see it anyway, so why should they extend any effort? I like to call this “the trilogy curse,” and it explains why so many second sequels end up letting down their entire franchise (*cough* Terminator 3 *cough*). The best thing that can be said for X-men: The Last Stand is that it does a good job avoiding the trilogy curse. While some may be frustrated by the liberties it took and the deviations it made from the source material, I for one found it to be very liberating. It changes things up a bit, made things different, and did one huge thing that many comic book movies can’t do: it made it unpredictable. Because of this, the stakes were higher, the action was more involving, and it made you invest yourself more in the characters rather than waiting for everyone to hold hands in the end for that “happily ever after” ending many films get trapped into. X-men: The Last Stand accomplished something important: it proved that comic-book movies can deviate from their source material and still be good. After saving both human and mutantkind at the shrouded site where Wolverine (Hugh Jackman) gained his metal claws and lost his memory many years ago, X-men: The Last Stand takes place as the X-men still try to cope with the death of their beloved Jean Grey (Famke Jannsen), who sacrificed herself to save her friends as she became engulfed by a sea of raging waters. Most affected by this is her boyfriend Scott “Cyclops” Summers (James Marsden), who can still hear her voice in his head as he sits in their bedroom reminiscing about her. The X-men, however, have a much more pressing issue at hand: a company called Worthington Labs has recently invented a mutation antibody that basically attacks mutant cells and nullifies them. The public dubbed it as a “cure,” and it essentially turns mutants into regular human beings, forever granting themselves the life of normalcy they’ve so long desired. Of course, this new invention stirs up quite a controversy among the mutant community, especially regarding Magneto (Ian McKellan) and his extremist brotherhood of mutants. When mutants come to terms with this cure and what it means for all of them, they must make a decision of whether or not to fight against the cure, or fight for humanity’s survival at all. The first out of the X-men series not to be directed by Bryan Singer, filmmaker Brett Ratner (The Rush Hour series) steps in to fill in the reigns of Singer’s mostly definitive first two installments. How does he do? Well, the good news is that he holds his own pretty well, and makes a movie that he can call all his own. Ratner poses an important question here that I think the other two films mostly sidesteps: if you have an unwanted gift, should you keep it? For me when I watched the movie, I saw an image deeper than that of a mutant standing in line to take a shot that would take away their powers. I saw a pregnant teenager waiting in line for an abortion for that baby that she never intended to have in the first place, or an image of a man going in for a gender change because he doesn’t feel comfortable in his current body. Controversial? Yes, but that’s how the film intends for it to be. Much like its predecessors, The Last Stand handles its political side well, and is being more ambitious by taking a different spin from the standard supremacist/racism themes that they explored in the earlier installments. The cast is good, but that’s standard at this point. We expect Jackman to be good as Wolverine. We expect Patrick Stewart and McKellan to be convincing as the leaders for their own specific causes. We expect Storm (Halle Berry) to be the strong female hero that she is, and we expect Iceman (Shawn Ashmore) to be the kind-hearted, considerate teenager while Rogue (Anna Paquin) remains the estranged and desperately shy mutant who continuously questions keeping her abilities. The one we should notice more than anyone else is Janssen as Jean Grey. Yes, she’s back, and she has a much more villainous spin on her that comic fans may or may not be happy to see. She’s much more versatile in this movie, bouncing brilliantly in between angry and hateful to scared and grief-stricken. Without giving too much away, I really liked her role in this movie as both a protagonist and antagonist, and I think X-men fans will be just as pleased with her performance as well. The only thing I don’t like with this movie is its climax. The buildup earlier in the film was so much better, with the backstory of Jean Grey, Professor X and Magneto culminating so ingeniously into a plot where all the danger was real and there was no way to predict who lived and who died. Another great scene with excellent buildup was when Wolverine went searching for Jean, fighting a small group of mutants within the confusion of a lush, maze-like forest. The final fight, however, could not have been more standard and one-note if it tried. It plays out exactly as you would predict it to, dragging out into a disarray of violence and loud noises until finally it ends in explosions and agonizing screams. Enough already. The rest of the movie did a good job building up anticipation: did you really have to give in right before the end? Still, I had fun with this movie. I know “fun” is a very loose term that can be used within the film community, especially when you’re speaking about a potential deal breaker such as this. Still, I’m going to say it: this movie was fun. Why am I saying that? Because I enjoyed it, that’s why. I genuinely liked it. I liked the big, boisterous action scenes orchestrated on a grander scale in which I don’t think would have been possible six years ago. I liked the darker, more thematic moments between characters where they took time to build up the stakes and what was on the line here. Mostly however, I liked how it humanized the mutants, and made them genuine flesh-and-blood human beings that could be killed and harmed. It didn’t immunize them from death because of their fans’ love for them: it made them mortal, and it presented a real, legitimate threat in the film because of that. I know many people who are going to disagree with me, and that there will be many who love these characters too much to be able to see them get killed off and just be okay with it. Let me set the news down with you easily: if you’re that bothered by seeing a character’s death in a movie, maybe you shouldn’t be watching that movie in the first place. These filmmakers set out to make a convincing movie where the threat was imminent and real: not to please the comic-book die hard who gets frustrated if a comic book character’s hair isn’t the right color. Maybe that was Ratner’s second goal beyond making a good sequel, to see how many changes he could make before the fans starting writing death threats to his home mailbox. A social commentary disguised as an action blockbuster. X2 is science-fiction brilliance, a sequel that is relentlessly exciting, smartly written, intelligently designed, and jam-packed with so many involving action scenes and stunning visual effects that it could potentially work as a stand-alone movie, rather than a direct sequel to its predecessor X-men. Like Lord of the Rings and Harry Potter, this movie serves as an expansion for the universe that it is in and as an opportunity to provide fan service to its dedicated readers and lovers of the iconic source material. I’m not very much for sequels, and I definitely don’t want this to become a superhero monopoly, but if we have to have sequels packaged with every superhero installment in the near future, more filmmakers should pull inspiration from X2. X2 picks up just short of a few months after X-men originally left off. After the combined efforts of the X-men defeated Erik Lenshurr, a.k.a. “Magneto” (Ian McKellan), and imprisoned him within a special plastic cell (Countering his ability to manipulate metal), the X-men go about their (ab)normal lives as teachers at Xavier’s School for Gifted Youngsters, educating mutants on how to control their powers and not be afraid of who they are. Only Logan, a.k.a. Wolverine (Hugh Jackman) sets out to Canada to seek out answers for his long-forgotten past, and even then he comes up empty: the lab where he was supposedly experimented on has long since been abandoned. Soon, however, a new figure from everyone’s past re-emerges: William Stryker (Brian Cox), a government official who has experimented on mutants for as long as mutants existed. After pitching his program to the President and revealing that Xavier’s School For Gifted Youngsters is a front to the X-men operation, the X-men and the Brotherhood of Mutants must band together to save each other from Stryker’s plot, and quite potentially the rest of mutant kind with them as well. 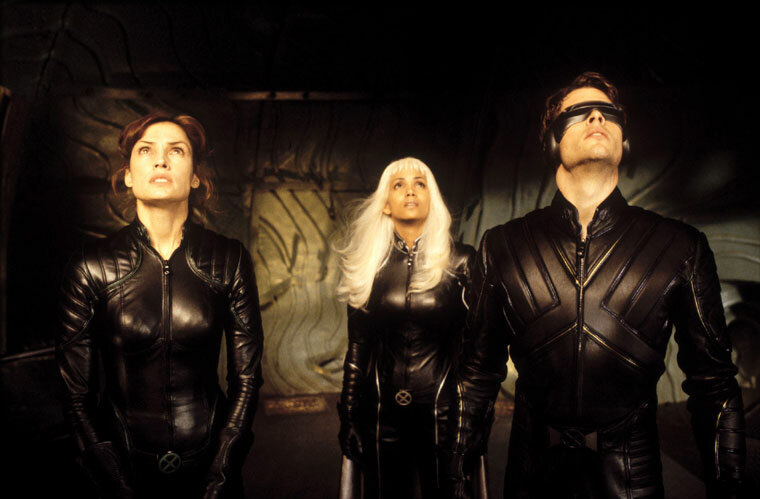 Directed and co-written by Bryan Singer, who also directed X2’s predecessor X-men, X2 is a highly involving, irreverently fascinating superhero epic. Functioning just as much as a political thriller as it does a superhero action flick, Singer is careful to deliberate and balance everything effectively in the movie, from its themes of xenophobia and racism to its highly-exciting action sequences where mutants go flying, flipping, and teleporting in every which way and under. Funny, the first time Singer tried X-men, balance was a problem for him. He put a greater emphasis on the action and the visuals of the mutant’s powers more than what they meant for them individually, quite possibly because that’s more of what the audience wants to see anyway. Here, balance is not an issue. He does a great job at both not only giving us a healthy dose of action-packed sequences of grandeur and excitement: he also does a great job giving us heartfelt, genuine emotion, showing these character’s internal reactions just as much as their external. 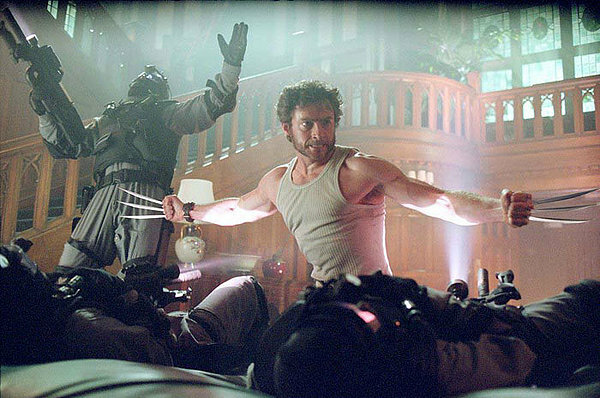 Example: After escaping from an attack on themselves and the rest of the X-men earlier in the movie, Wolverine takes himself and a small group of mutants to Bobby “Iceman” Drake’s (Shawn Ashmore) home, where he’s forced to essentially come out to his family that he is, in fact, a mutant. After seeing the emotion and disparity of his family reeling in with the shocking revelation of Bobby’s abilities, the police pull up to the house, and an explosive battle results between these X-men and the officers. See, this is what I’m talking about: there isn’t a single moment in the movie where the action outweighs the drama, or the drama outweighs the action. For every scene where something emotionally weighty or significant is revealed, there is another scene where something exciting or thrilling happens that jump-starts your interest all over again. Whether it’s a scene involving dialogue between characters, a narrator giving exposition on a conniving plot, or another scene where some sort of grand, explosive battle takes place doesn’t matter. It’s always moving, it’s always doing something different, it always keeps up its interest and it is never boring. I’m very happy with this movie. In a world where so many sequels make the mistake of replacing genuine emotion with an overdose of action and visual effects, X2 is a clear standout. While not necessarily perfect, and still incapable of escaping from some of the cheesy, ham-fisted moments that I rued in the first movie, it definitely stepped up its game as a far as drama goes, and has deeper contexts to offer regarding the xenophobia/racism issue that inspired the series as a whole since its comic book creation. In that sense, X2 is more than a superhero blockbuster. It’s a social commentary on judging another person for who they are and the destructive consequences that can come from it as a result. Racism, xenophobia and too many super-mutants to count. We open on a quiet, haunting frame of a familiar image. Poland, 1944. As German soldiers stand on top of brick rooftops with rain pouring down their uniforms and gun barrels, soldiers at ground level file Jewish citizens from one line into another. One soldier separates a young boy from his aging parents. The mother screams out in agony, aggressively pushing against the flow of the crowd just to get to her son. Soldiers block her path, her husband trying to hold her back while desperately trying to hold back tears. The son, who is kneeling in fear as both tears and rain pours over his cheeks, rushes through the mud to get to his parents. It’s too late: the gate has already closed. Frustrated in grief and agony, the young man reaches out to the fence as soldiers hold him back, as if he’s wishing the bars to bend so he can escape and save his parents. Before a soldier comes up and knocks him out, his desires becomes his reality: the metal fence is left as bent and tangled as a twisted paperclip. This is how Bryan Singer’s X-men starts off, with a visual metaphor for bigotry and discrimination where we don’t quite understand what happened, but its emotional power retains itself regardless. The plot goes from the dramatic to a much more stranger turn when we’re introduced to the film’s premise: a new form of species is identified as “mutants,” who are superhuman beings who develop extraordinary abilities through a biological change in their DNA. There’s nothing they do to forcefully trigger the change: it’s as natural as a teenager going through puberty. What does society choose to do with these mutants? They scrutinize them, convict them and force them to submit to their mutant registration program where they will be forced to reveal themselves, otherwise they will be considered enemies of the state. The plot goes much deeper than that. The mutant race has been mostly split in between two factions. One of them is the Brotherhood of Mutants, an extremist group led by the gray-haired and calculative Magneto (Ian McKellan), who you will notice was the little boy we saw in the earlier-mentioned credits. The other organization is hidden under the secrecy of a preparatory school called “The X-men”, a group of mutants who train other mutants to control their powers rather than be afraid of them, led by the passively-oriented Professor Charles Xavier (Patrick Stewart). There’s too many other mutants in this movie to keep track of, and even a short roll call won’t cover all of them either. There’s Rogue (Anna Paquin), a teenage mutant who absorbs the life energy out of any being that she touches. There’s Storm (Halle Berry), a silver-haired centurion who can summon lightning bolts and powerful winds through her ability to control the weather. 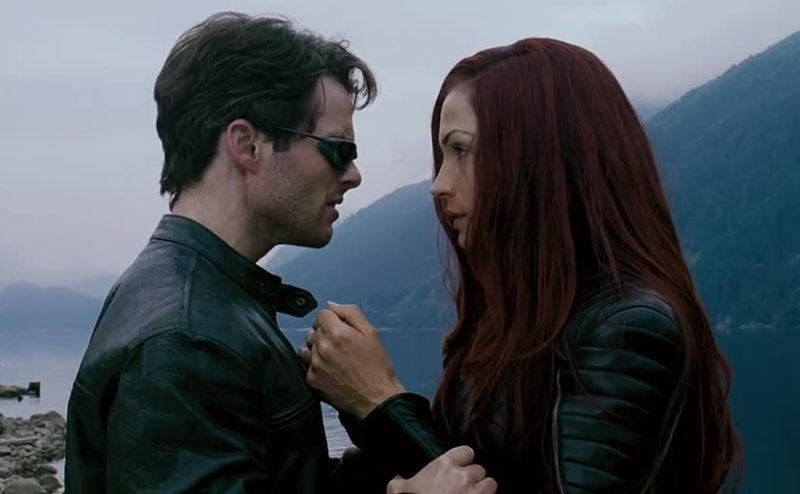 There’s Jean Grey (Famke Jennsen), a telepath who lives with her boyfriend Cyclops (James Marsden), who can obliterate anything with a laser beam simply by looking at them (makes you wonder how they take care of their evening business in the bedroom…). Perhaps the most recognizable mutant here is Wolverine (Hugh Jackman), who came into the X-men with Rogue after spending years trying to remember who he was and where he came from. Wolverine has the most unique ability out of these X-men by being able to heal at a faster rate and protrude claws out of his fists when threatened. So there’s that. Long story short, the Brotherhood of mutants hatch a scheme against the human race, and the X-men must rise up to stop them. Doesn’t sound like any other superhero team-up action flick out there, right? Let me start off with the positives. To put it simply, X-men is just a big ball of fun. Whether we’re laughing from a line of scathing dialogue between Wolverine and Cyclops, or watching a thrilling action scene between two mutants fighting on top of the Statue of Liberty, there’s so many memorable moments to look at and enjoy regardless of how hammy or preposterous they might be. Because of this, I think I have a good idea of who this movie was made for: it’s made for the comic-book die-hards, the kids that would freak out in glee and excitement when they get their never-before-opened copy of The Uncanny X-men #141 in the mail for the first time. For me, my experience with the X-men comes from the 1990′s saturday morning cartoon, the one that included these characters and more in a colorful, energetic and fast-paced ensemble that had much more time and episodes to introduce these characters and delve a little more into their backstories and motivations. For me, this movie hits a few notes on that feeling of nostalgia and then misses on others. I like a lot of what this movie had to offer, from the exciting and uniquely-packaged action scenes all the way to the more dramatic, tensely-driven moments, such as when a mutant argues with a U.S. Senator on mutant rights. Again, I know where this feeling comes from. Earlier in his career, writer and co-creator Stan Lee created the X-men as a response to the civil rights movement, as an allegory to how people are afraid and hated by other people just because they are different from them. With this movie, I was hoping it would delve into those themes as deeply as Spider-man did with his themes regarding love, guilt and responsibility. Instead, it chooses to make the makeup and visual effects the stars of the movie, showing us cool, flashy effects of people in black leather costumes instead of making the story and themes itself the focus. The movie is a playground to show off what kind of cool tricks these kids can do: not a serious drama about why the two kids are fighting on the playground in the first place. Here’s the critical factor that saves this movie from just being another standard action flick: the cast. I’ve already mentioned how this movie touches up on some of the nostalgia from the original cartoon. This cast is the reasoning behind that nostalgia. McKellan was conniving as Magneto, a torn and hateful man who sees only one outcome in the human-mutant conflict, an extremist not too dissimilar from that of Malcolm X during the civil rights movement. If he’s Malcolm X then, Professor Xavier is Martin Luther King. Jr., a patient, kind-hearted and wise man who wishes to co-exist with the human race, and defend both of their rights for the sake of that future. I especially liked Hugh Jackman as the feral and vicious Wolverine, a man who definitely has that hardened, rough edge to him, but also that soft spot where he feels protective over those who can’t protect themselves, almost like a papa bear over his little cubs. The script is the transgressor for the silly, generic plot: the cast is what elevates this film above its mediocrity and makes it more than what it actually is. Overall, I liked X-men. I wish it could have been better, being that the source material is among the most original and influential comic books ever conceived in print, but I’m willing to let that pass for the sake of the franchise’s potential future. If the movie aimed to be nothing else except for visually-splendid eye candy to fill the gleeful hearts of comic book nerds, this movie succeeded. Hey, at least Stan Lee’s Marvelites will be satisfied. Pretend G-men trying to skip out of class. The very first shot of X-men: First Class is the exact same scene of the Holocaust, frame-by-frame of the very first X-men movie directed by Brian Singer. Not a good way to start off your movie by copying another one, isn’t it? The very next scene after briefly skipping through that one is a young Charles Xavier’s encounter with a young, hungry blue-skinned mutant named Raven who was trying to steal food from his refrigerator. Talking to her in a very sincere, comforting voice, he assures her that she doesn’t have to steal, and reaffirms it by saying that she’ll never have to steal again. Touching. I wonder how this conversation went over with his mother? Years pass, and we’re reintroduced to the characters we’ve come to know for the past few movies now. Erik Lenshurr (Michael Fassbender), the man soon to become Magneto, is out on the hunt, looking for the man who killed his family and tortured him as a child back when he was a Jew in the concentration camps. Charles Xavier (James McAvoy) is now in college with the now much more mature Raven (Jennifer Lawrence), who is pursuing his masters degree in psychology. There’s a mutual enemy that unites these three individuals together: Sebastian Shaw (Kevin Bacon), a menacing and conniving mutant with the ability to absorb and redistribute energy. That means a grenade can explode in his hand and he can transfer the explosion straight into you with a touch of his finger. Shaw is the man who tortured Erik back when he was a young child, and Xavier discovers a sinister plot that Shaw is setting to unveil upon the world. Erik and Charles combine their resources and their efforts to form a mutant team to work together and stop Shaw. And how exactly does Shaw plan to carry out this giant, dastardly plan? By conspiring and coercing the Cuban Missile Crisis among nations, that’s how. How original. I wonder if these guys considered overthrowing the Chinese government while they were at it? Hypothetical question. If you hear the term “prequel” being used, what’s the first thing that comes to mind? For me, its the word “beginning”. Beginning, as in, the start of the story. Beginning as in, the start of a legacy. Beginning as in, filling in the holes of all the ambiguous stuff we were told in the original trilogy, and beginning as in making sure everything fits into a nice, nifty little package by the time the end credits roll. 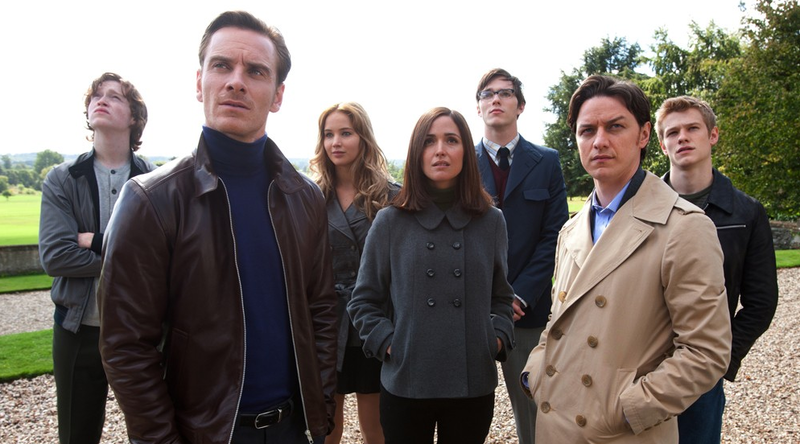 As a superhero blockbuster alone, X-men First Class succeeds. It’s exciting, it’s visually stunning, it features everyone’s favorite X-men that they’ve come to know and love, and it has enough comic book lore in it to make even Kevin Smith giggle with glee. As an action movie meant to please summer movie lovers, it is fine. As a prequel to the critically-acclaimed series that it is based on, however, it is utter and absolute failure. Three of the biggest goofs that completely and utterly frustrated me. 1) There were flashback scenes in X2, X-men: The Last Stand, and Origins: Wolverine where Xavier is clearly seen as to being able to stand. Yet at the conclusion of First Class (spoiler alert!) Erik deflects a bullet into Xavier’s spine, permanently paralyzing is legs. 2) In the first X-men, Professor X audibly said to Wolverine that him and Magneto helped build Cerebro together, while in this movie it is very clear that a mutant named Hank McCoy (Nicholas Hoult) was the one who built it instead of them. Magneto’s helmet also didn’t exist prior to X-men, whereas here it already does. And lastly 3) a cameo appearance of a certain three-clawed mutant meeting Xavier and Erik about halfway through the movie at a bar. Wouldn’t they have remembered him thirty years later, especially since one of them is a telepath? These ignorances to the plot show me that instead of providing an accurate prequel to a highly-revered superhero series, the filmmakers were more interested in letting loose and having fun rather than making something straight-laced and refined. I’m all for fun and high-octane action movies, but if you go in ignoring everything else that happened in the movies previous to your own, you’re being disrespectful to the franchise. Oh, the cast was more than exceptional, I won’t deny that. McAvoy portrays the younger Professor X wonderfully here, passing himself off as a sort of young Patrick Stewart that’s more reckless and immature than his older self. Bacon is smug and charismatic as Shaw, and even though his role wasn’t as compelling as Ian McKellan’s was in the original trilogy, it still served its purpose in the film. I especially enjoyed Fassbender’s performance as the angry, relentless, and grief-stricken Erik Lenshurr. The staple performances in the series overall belong to Patrick Stewart and Ian McKellan, there’s no doubt beyond that. Still, Fassbender gives it his all here. You notice the effort he extends here, the passion and the fire he instills in this character. McKellan’s rendition of Magneto was calm, collective, and calculated, a great foil to the equally intelligent but more morally aligned Xavier. Here, Fassbender is neither calm nor calculated. He is simply a raging, hateful man, a mutant who has been in pain and alone all his life, desperately seeking some sort of way to fill the emptiness within his cold, solemn heart. I genuinely liked and appreciated his take on the character, even though he bends missiles in one scene that look about as realistic as a Tom and Jerry cartoon. “But wasn’t it fun?” is a common argument I get from a lot of moviegoers. “Fun” is such a subjective word, and can mean any one of different things. In the aspect of simple, plain, straightforward blockbuster fun, I guess this movie satisfies. The problem is I didn’t go into X-men: First Class expecting a brainless blockbuster. I went into this expecting this to be exactly what it claimed to be: a start to the X-men’s journey, an insightful and hot-blooded prequel that showed perspective on how their story began. This wasn’t even close to being a prequel, ending with more questions where there should have been answers. Fox has already announced that a sequel is currently in the works to be released sometime in 2014, and here I am, thinking that these kids need to go to summer school before even thinking about going into the second semester.